← Asda & Jasper’s own blog! I stood outside Bella for a bit to try and get my Garmin to ‘Find Satelittes’ but it wasn’t playing ball so I just started the timer and hoped it would find them at one point. It ended up it didn’t find them at all. Odd. I’ve rebooted it and it seems to be ok now. Anyway, we ran just over 5 miles in 46:46 which is about 9:12 min mile pace. Gill was running strong and kept her pace throughout. 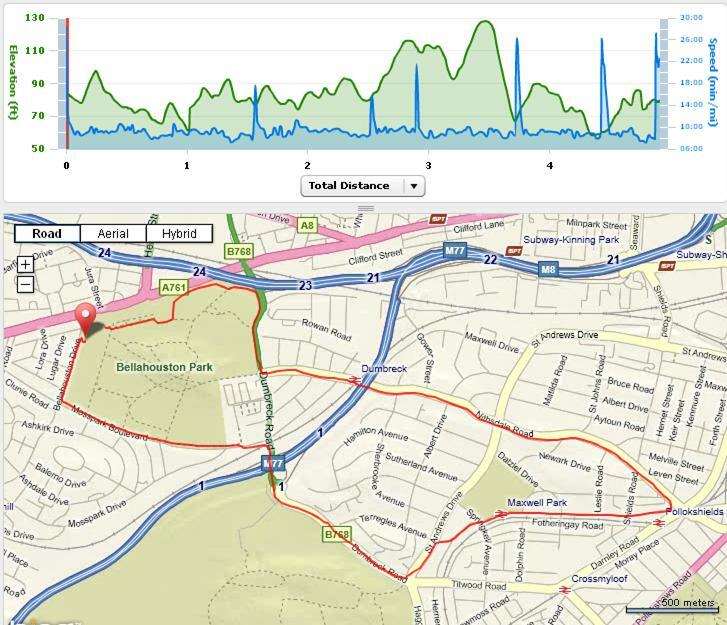 We ran the route back to front today, going through the park first and up Nithsdale Road and around by Dumbreck Road which seemed to be easier for some reason. Perhaps we’ll run it that way all the time. On the run there were quite a few puddles we had to go through. One right at Bella and one very large one at Dumbrek Road. Gill immediately showed her aversion to puddles when she stopped dead at the first one and tried to tip toe around it. I showed her (as Jackie has showed me) to just run through it… you tend not to get too wet, and even if you do, there will be more puddles to go through so it’s best to get used to it. Run: 5M, 46:46, Pace: 9:12, Calories: 400. This entry was posted in Run and tagged 5, gill, miles, run. Bookmark the permalink.